Heuglini adult, January 12-16 2005, Oman: Barka. 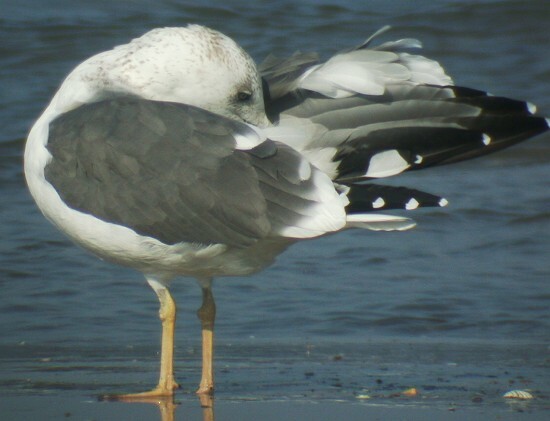 The image below shows a preening adult heuglini. - Upper parts dark grey; much darker than in cachinnans and barabensis; but slightly paler than fuscus. - Late moult timing of the primaries. In this individual, all old outer primary have been shed, and P8 is full grown. P9 - P10 still growing. - Visible inner primaries and the primary tips look brand new, recently moulted. The mirror on P10 is obvious, covering both webs. P9 doesn't show a mirror. Heuglini showing a "merged tip" on P10 seem to be very rare. Merged: the mirror completely merges with the very white tip, so there is no sub-terminal black band. Such a pattern is rare in heuglini.